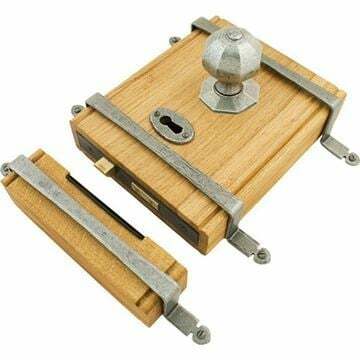 The Oak Box Lock & Octagonal Knob Set is by From The Anvil. Manufactured from unstained English oak. Supplied complete with octagonal knobs and separate roses. Box lock: 223mm x 172mm. Keep size: 223mm x 36mm. Contains a five-lever British lock which offers excellent security. For use on doors with a 44mm maximum thickness. Thicker doors can be accomodated, please contact us for more details.